On September 21, classics music lovers will have the opportunity to see and hear the Romanian Radio National Orchestra (in picture) under the wand of Cristian Mandeal. Few days later, on September 26, the Romanian Radio National Orchestra will be again on stage, this time under the wand of Case Scaglione. According to the official page of the festival, Cristian Mandeal studied piano at the Ciprian Porumbescu Conservatory for 10 years (from 1965 to 1975), conducting (with Constantin Bugeanu) and composition (with Ştefan Niculescu) and later attended the master classes held by Herbert von Karajan in Berlin (in 1980) and by Sergiu Celibidache in Munich (in 1990). After a short period as accompanist at the Bucharest National Opera (between 1974 and 1977), Cristian Mandeal had his first appointments as conductor of the Philharmonic Orchestras in Târgu Mureş (from 1977 to 1980), Cluj-Napoca (from 1980 to 1987) and Bucharest (from 1987 to 2009). He was General Director and Principal Conductor of the George Enescu International Festival and Competition in 2001 and 2003. He has performed the British première of Enescu’s Oedipe with the BBC British Orchestra in the programme of the Edinburgh Festival in 2002 and the Italian première of the same opera at Teatro Lirico di Cagliari in 2005. Since 2008 he is president of the International Enescu Society in London. The 2014/15 season sees Case Scaglione return to the New York Philharmonic for concerts with Joshua Bell. This follows his promotion to Associate Conductor – a position that was revived especially for him by Music Director Alan Gilbert. Scaglione began his tenure as Assistant Conductor with the orchestra in 2011 and made his subscription debut in November 2012, stepping in for Kurt Masur. He made his professional conducting debut with The Cleveland Orchestra in 2010 after being awarded the Aspen Conducting Prize in the same year, and in 2011 he was recipient of the Conductor’s Prize from the Solti Foundation US. As Music Director of the Young Musicians Foundation Debut Orchestra of Los Angeles from 2008 to 2011, Scaglione was the driving force behind the continued artistic growth and diversification of the organization. Initiatives included his founding of 360° Music, an educational outreach program which brought the orchestra to inner city schools. Scaglione’s eclectic programming included music by Ligeti, Wagner’s Tristan und Isolde – the orchestra’s first staged opera in nearly 60 years – and the Los Angeles premiere of John Adams’ Doctor Atomic Symphony. 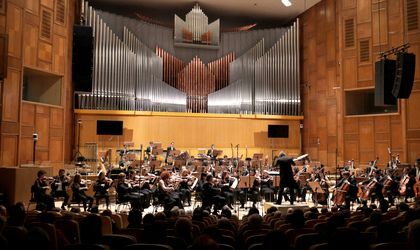 Between September 20 – 27, Bucharest will be endowed once again with the enthralling fervour and artistic vigour of a vivid European capital at the 2nd edition of RadiRo – Radio Orchestras International Festival. For an entire week, at the end of September, the concert hall and the ‘sound podium’ will join together at the RadiRo Festival, a unique musical event in Europe, which will bring in Bucharest five radio orchestras, along with internationally renowned soloists and conductors.